None of my Pelikan pens had slits that were too narrow. I agree the Pilot 823 has a similar feel as the m80x and is a very good option for less money. I love my 823 in B as much as I do my M805. I would not give up my m805, but the Pilot is a top pick. I'm not saying all Pelikan nibs are dry, but most of mines were. I prefer wet writers and bought broader nibs of Pelikan such as M800 OBB, M400 B and etc. They were too dry so didn't lay down BB or B lines. Thinner ones such as PF M1000 F and M450 18C F were good. Anyway, I wanted to say having too dry Pelikan is not a rare situation, based on my particular experience. Maybe I was in a bad luck. Firstly, I'm so sorry to see your reward for yourself did not do its job well. 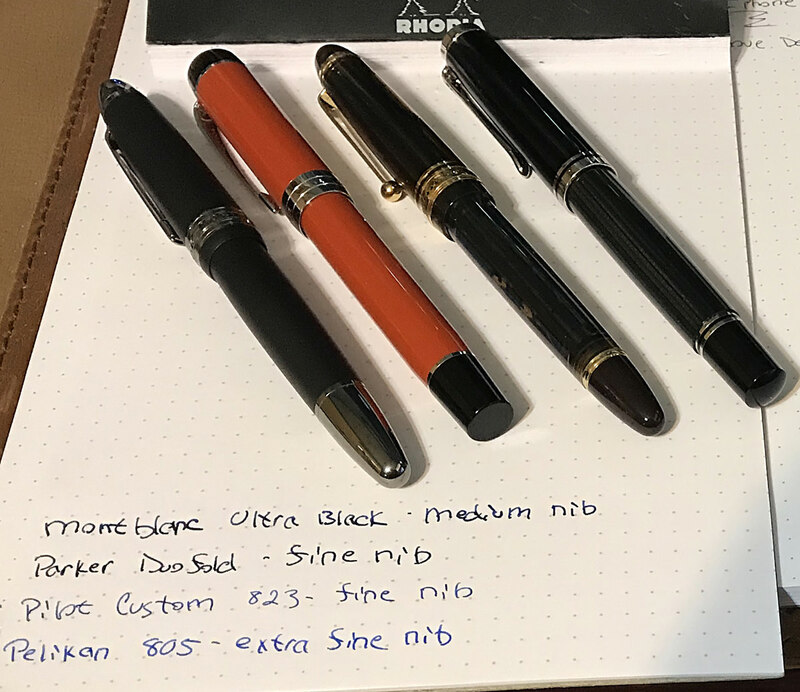 I have multiple Pelikans, and I think their nibs are not in good condition right out of the box. Mostly, their slits were too narrow. So they were dry and I had to adjust them. If you still want to have some pens at that price range, I recommend you to try Pilot, such as Pilot Custom 823. Pilot will never disappoint you. I think Pilot Custom 823 with B nib will fit to your taste as you like western M nibs. Thanks for the recommendation. Do you know of anywhere in the UK that sells that pen? Sorry for the crappy phone picture here. I just got my Stresman and inked it up - it's writing great! For comparison purposes I showed how it compares to the other 3 pens I currently have inked up.The Montblanc (medium) and Parker (fine) have darker ink so they seem a bit wider (i think they are maybe just a bit wider) but they're very similar to the extra fine Pelikan. The Pilot Custom 823 (fine) is noticeably finer. Sadly - any pen you purchase may or may not be super smooth out of the box. It's mostly just the luck of the draw based upon my experience. Thanks for the update, I'm glad you like your pen! Honestly, the line from your extra find looks wider than the line I got from my fine. I think I was just unlucky with the nib I got. nibs.com is run by a famed nib meister John Mottishaw, and they check and adjust all the pens bought from them before they send them. As I just checked, nibs.com price is a bit more than Japanese sellers' on Ebay, but far more reliable. And look at the Italix Churchman's Prescriptor, but don't be fooled by the fact that the price is about 15% of what you paid for the Pelikan. +1 Stunning pen. I have a broad and its the smoothest nib I've ever written with. Outrageously so.... And Mr. Pen have customer service that is second to none. I've just watched a couple of reviews for the pen, and it seems that its a great pen at a good price. I just placed an order for one with a medium nib! I haven't decided yet on whether or not to give the Pelikan a 2nd go. The binde seam really isn't too much of an issue so long as the pen writes well. You're probably right that I just got unlucky with it. I really was surprised by how dry it was given all I've heard about Pelikan nibs. I actually just saw the picture of the new Stone Garden edition of the Pelikan M800 and it looks stunning! So that's worth looking at. I believe the writing desk here in the UK offer a similar service with testing and adjusting the nib before shipping, so I am considering getting a medium from them. The paper/ink definitely isn't the problem. I was using Iroshizuku ink on Rhodia paper. I think you should have tried the pen with a couple of other inks. My experience is that usually Pelikans don't need it (Platinum 3776s are much pickier about what inks they like), but if I have a new pen and it doesn't work with the first ink I put in it, I usually try Pelikan Koenigsblau or Waterman's blue, which are really reliable inks that get on well with most pens. Sometimes you get the wrong impression with the first inking. And using another ink sample is much cheaper than sending the pen back. Regarding the stripes; some of us really love the unevenness in Pelikan stripes, particularly on pens like the White tortoise where the colours vary. But hey, "different folks different strokes" or in newer parlance YMMV. Some new pens I have had needed a day, plus or minus, for ink to penetrate the feed and flow properly. Something to think about for future reference. An 800 is a nail and has been since 1998. The modern' post '97 400/600 are semi-nails. The 200 is springy regular flex. The 1000 can be either regular flex or semi-flex. '82-97 400/600/800 ('87-88?-97) are regular flex, as are the Celebry and 38, and '85-to now 200. The W.Germany nibs are a tad more springy than the Germany nibs of that era. Vintage '50-65 are semi-flex or rarely maxi-semi-flex.....out side of the 120 which is regular flex. In Vintage there is the H nib which is a hard nib (manifold/nail), and the D nib that is the nail's nail (have one of those). But those are vintage and marked. Pelikan was designed for a dry 4001 ink...that it felt dry with a Japanese ink...I don't know how wet or dry each brand of Japanese inks are.....in they were E70 or $85 until Amazon dropped the price to @E20/$25. Edited by Bo Bo Olson, 17 September 2018 - 21:53. I tried it with Iroshizuku Ku-Jaku ink and following that, Diamine Asa blue. The pen wrote the same with both inks. I'm pretty sure I just got a bad nib. The ink flow was extremely poor. As I understand, this isn't a complex issue to fix, but at this price point in not willing to take on that risk. Oh and with the stripes, it's not just the unevenness. I actually liked the way the stripes varied with one another. The issue was that one of the stripes was almost black and it stuck out like a sore thumb. But again, I could live with that if the writing experience was good. Send it back, with the faults noted. 1. All 800 nibs are firm. The only bounce you will get out of Pelikan will be on the M1000 and some of the older 'revival" models like the tortoise, but even those are going firm - such as the relatively recent white tortoise. 2. The stripes will have variance. I actually quite like that, but it might bother some and clearly bothers you, but its not a fault. 3. There may be an issue with your nib. Every Pelikan I own writes quite wet; never had one write dry. 4. Any pen that doesn't write as it should that lands in my hand gets immediately returned. Any product that doesn't do the primary thing it was designed to do gets returned; why accept it in a pen when you wouldn't with any other other product. 5. Mess with that nib, drag it across some mylar and you've voided any prospect of replacement. I'd return it. I've been a very happy customer of Cult Pens before. If there's an issue I'm sure they will address it. The first new Pelikan I purchased, an M800 (full retail - didn't know where to look for the best prices at the time) has imperfections with the stripes too. I was a little disappointed with it but now I understand that's they way they're made. Part of the charm IMO. Looking back I think I was perhaps expecting too much which is likely normal when one starts to purchase more expensive pens. You read all the reviews and see all the praise people heap on these higher end pens and when you finally decide to do it you get it and realize that in the end it's just a pen. Not perfect, doesn't write 100% perfectly to your liking (many don't) and it doesn't make you more handsome or taller. I spent $$$ for a new Montblanc 146 from a boutique (I wanted a pristine one that had never been used!!) and was so excited to write with it. Turns out it would skip a couple times per page.Nothing major - just little skips. Made me crazy. How in the world could a pen that cost *this* much skip??? Turns out it had a minor case of baby's bottom - a couple minutes gently smoothing it on some micromesh and it's now one of the best writing pens I own. I've also purchased Jinhao pens for $2.00 that write wet and smooth and great right from the start. Turns out it's really doesn't matter how much a pen cost - there's always a chance it won't be to your liking or function up to spec. Crazy hobby! You've received plenty of comments and suggestions, most of which I concur with. It's worth the effort to learn a few basic nib adjusting tricks. It's not uncommon for tines to get out of alignment after using a pen for several years (especially if you ever let someone borrow the pen). I won't do anything too crazy, but a basic smoothing, tine alignment, and making a pen wetter are all very easy, even for a beginner. There are some good YouTube videos showing how to do each of these things. If you don't feel comfortable starting on an M800 (understandable), practice on a cheaper pen. As long as you go slowly you're not likely to cause any permanent damage. I've had to adjust a handful of pens (even an M800) and have yet to damage any (and this type of thing is not in my normal skillset; I'm as handy as a bike rack). I've also had a couple pens that needed more work than I felt comfortable with and sent those to a nibmeister (e.g., the tines on my M1000 were visibly misaligned when I received it). Also, generally you get what you pay for. £300 is a fair deal for an M800 but still well below many retailers. You'll pay more for the same pen at nibs.com or nibsmith.com (or other shops with in-house nibmeisters) but they'll generally adjust the pen for free when you order. Yes, dry nibs can usually be improved by flossing the tines with a brass sheet (easily available from Goulet or probably other pen shops in your country) and a then a good flush afterwards. If it's a bit unnerving to try on a pricey pen, maybe get a few cheapies like a Pilot Varsity or Platinum Preppy and play around with tuning their nibs to different inks. Then the next time you get a pen you really love with a nib you feel could use some tuning, you'll be ready to handle it yourself. This all assumes that you plan to buy more than one fountain pen, of course! And how could you not? They are pretty addictive! Quite true. This has been my experience too. Micromesh has saved me from throwing many a pen across the room in frustration, lol. I've also had to make a nib DRASTICALLY wetter. I had a TWSBI that was so dry the line it wrote would literally go from a medium right after filling it to an extra fine by the end of a page. Drove me crazy! Edited by sirgilbert357, 18 September 2018 - 14:28. Yes, I've seen this before on certain pens. There's a term for it I think -- the feed needs to be "seasoned". There's something about how the ink is repelled by the fresh, clean plastic in the feed. The Pelikan nibs have well defined shoulders - simply grab each shoulder and gently tug the tines open for a few seconds. Then test. Rinse later repeat until you have the gap you want. If you overshoot you gently squeeze the shoulders for a few seconds to lessen the gap. It's stupid easy and can dramatically change the ink flow (assuming the issue is the nib and not the feed) in a pen! I tune 75% of my pens and I'm no nibmeiaster. I've yet to ruin or damage one. Edited by TheRealMikeDr, 18 September 2018 - 14:35. I have experimented with nib adjustments in the past. I have micromesh, brass sheets and a loupe for just that. I've watched several guides online and I tried it out on a couple of relatively cheap Twsbi nibs. The problem is I'm just not comfortable making an adjustment like that to a pen that costs this much. At least not until I have a much better grasp of it. As unlikely as it may be, I could end up making the situation worse, and end up with a pen I can't return. I'm more comfortable with just returning the pen. Sending it to a nibmeister would probably be a better solution, although I'm not aware of anyone in the UK. Any recommendations?